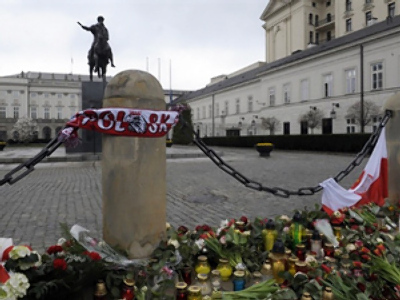 A memorial service in Warsaw drew a week-long mourning period to a close. Over 100,000 people came to pay their last respects to the Polish president and 95 others killed in a plane crash near Smolensk, Russia. During his speech, the acting president, Bronislaw Komorowski, expressed gratitude to Russia for its support. "In these difficult times, for our country we have not been alone,” he told the thousands gathered for the memorial service. “We can be grateful for this to the citizens of Russia, who have unexpectedly conveyed compassion to Poland and the Polish people." Earlier, major air traffic disruptions caused by a plume of volcanic ash from Iceland threatened to disrupt plans to hold the funeral of late President Lech Kaczynski and his wife Maria on Sunday. Airspace over most of Poland has been closed. Rumors have surfaced that such interruptions could affect the arrival of around 70 high-level delegations due to attend the state funeral. World leaders, including German Chancellor Angela Merkel, US President Barack Obama and Russian President Dmitry Medvedev planned to fly to Poland. Polish Minister of Foreign Affairs Radoslaw Sikorski confirmed the date, saying the funeral was expected to take place as planned, regardless of the weather conditions. Sikorski also told RT that the tragedy could help forge a closer bond between his country and Russia. “We are still in mourning and not quite ready to get back to politics, but we hope that the fact that President Medvedev and Prime Minister Putin reacted to the crash, to the tragedy, in such an empathetic way, we hope it will strengthen the already promising mutual gestures of wanting to improve our relations,” Sikorski said. The Polish delegation of high-ranking government and military officials killed in the plane crash was traveling to Katyn to commemorate the 70th anniversary of the massacre of over 20,000 Polish officers by the Soviet secret service.